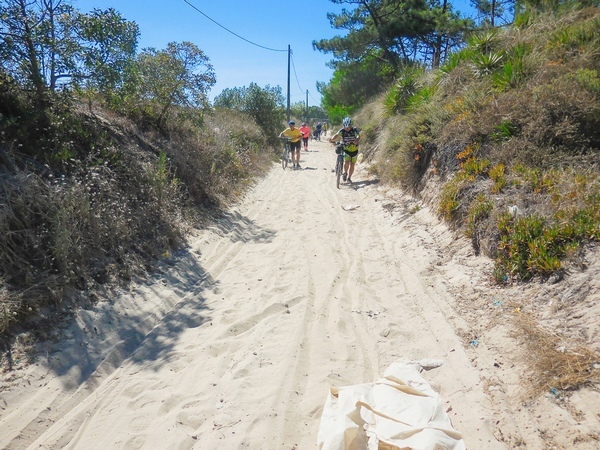 This year’s bike pilgrimage organized by Orel Uherský Brod lead to Fátima in Portugal, starting in Vega de Valcarce with a break in Santiago de Compostela. 120 pilgrims in total, aged from 12 to 80 traveled 750 km and gained over 10 000 m of elevation. 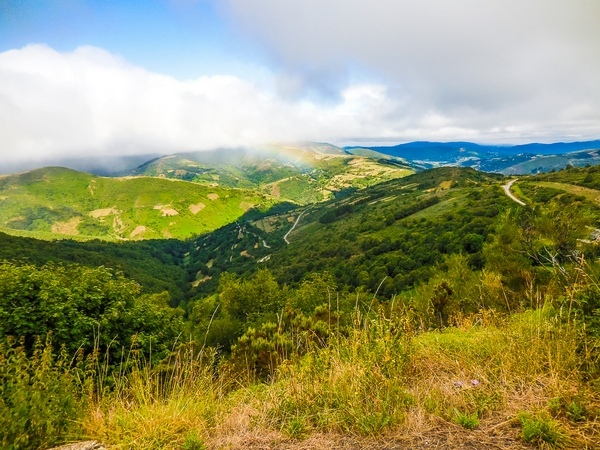 In this article, I’m summing up my experience with creating pilgrimage routes for a diversified group of cyclists and traveling in foreign environment with Locus application. After last year’s experience with planning the route to Krakow I resolved to use the routing service Brouter again. Of course it’s possible to prepare routes in Locus too but the large PC screen makes the planning much more comfortable. What’s more, BRouter web enables direct editing of the routing profile and the calculating algorithm can be fine tuned almost to perfection. Finally, anyone who has already planned a route for a group of a hundred people including kids and seniors riding all possible kinds of bikes can imagine how difficult it is to find routes avoiding traffic as much as possible along with compacted surface at the same time. The result of BRouter planning usually needs some more adjusting. Not only because you need turns to some interesting places but also in order to make the route straighter when the router tries to avoid traffic too eagerly. The best tool I used to tackle this was MyGpsFiles. It can edit ready made GPX files easily and, furthermore, display it in Google Earth 3D, which is very convenient for route planning in a completely unknown areas. Last web tool I used for planning is Ride With Gps. It can render the route on a map in the most printer-friendly way. The print has decent contrast and mileage is added to the route which is very practical. Finalized GPX files were imported to an individual route folder in Locus. Next step was to pinpoint landmarks along the route as points of interest. I’m not going to describe overall Locus setting but I can recommend one thing – set autozoom levels in a smaller range, e.g. 15-17. When you need an overview map on the road, just tap the zoom lock button and enjoy any zoom you like. I don’t use navigation along the route, I just display the route on map and from time to time check we are still on it. Navigation consumes too much energy and as we made deviations from the original route all the time, there was no need of it. 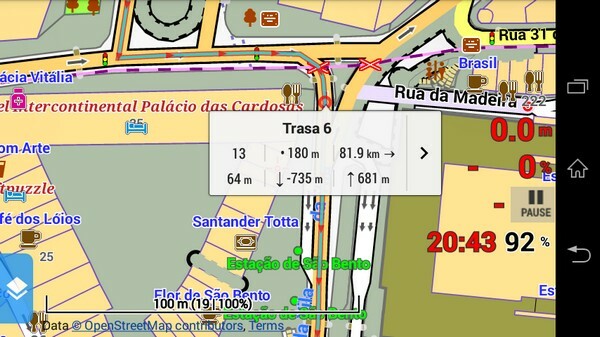 Traveling abroad I always use Locus vector maps – LoMaps. They are clear to read and contain a great POI database which I searched very often for nearest restaurants of swimming pools. There’s a very comfy feature “Nearest points” for this occasion. It’s much better to have such an offline database than rely on online information along the route – it saves battery and the internet connection is not always available. It may seem strange for somebody but I had better experience with landscape screen orientation. I switched the map to the highest contrast in an external theme called paws_cyclist that can be downloaded here >>. This can be quite an individual approach and everybody can choose display and theme settings best suitable for their style of riding. I have automatic function panel hiding on because the buttons just decrease the map space during the ride and they can be easily turned on by double tapping the screen. I also use a simple dashboard with basic parameters like distance, time of ride, clock, battery status, elevation, steepness % and track recording pause button. It’s very handy e.g. for quick coffee breaks. If you don’t pause the recording Locus and GPS keeps looking for the signal and wastes the precious energy (and also records nonsens trackpoints if you haven’t “movement only” turned on). 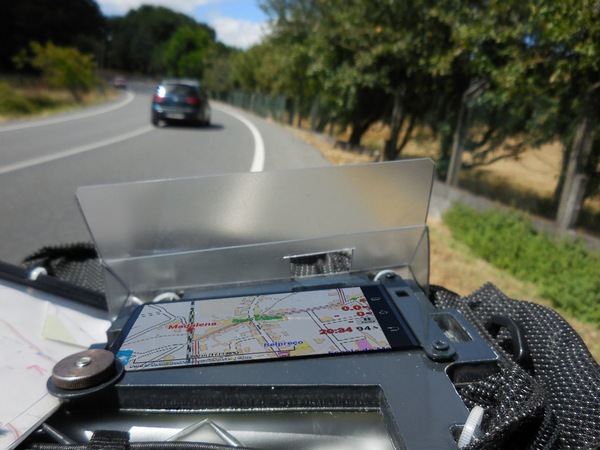 During the ride a very useful tool is to tap the route on screen and read the remaining distance to the finish in the popup box. After my experience from the previous events I decided to use Locus on a different device than I use for calling/texting etc. It’s quite impractical to remove the phone from the holder every time I make a call and also the device quite suffers from being at mercy of the weather. That’s why this time I launched an older spare phone, uninstalled everything from it, left only Locus + BRouter. Turning it to the “aircraft” mode with wifi off the phone was holding charge for an incredible time – it was no problem to ride over 100 km without need to plug it in a powerbank. Despite this I recommend to take it with you for the case the battery runs out just in time you need to find accommodation at night. My experiences from previous cycling events also inspired me to build a special mobile holder on a handlebar bag. A phone packed in a common closed holder often suffers overheating on sunny days, restarts itself or stops working at all. It’s also handy to place the paper map next to the mobile so you don’t have to switch the screen on so often. The handlebar bag has more advantages – you can place all valuables in it – camera, money, passport etc. When you have a break, just unhook the bag and go for the coffee – nothing precious stays on your bike. 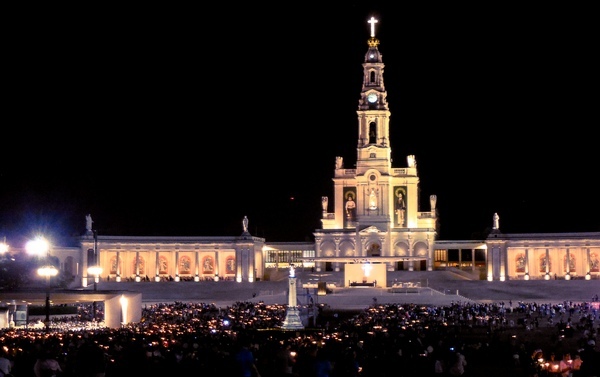 This year’s pilgrimage of our team was aimed at Fátima in Portugal, honoring the 100th anniversary of the Virgin Mary’s revelation to a few kid shepherds in this now well known place. 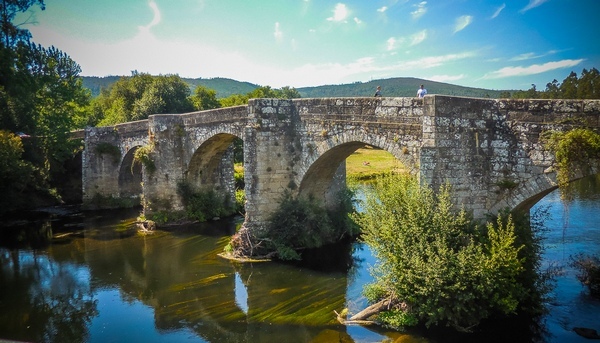 The starting point was in a Spanish village Vega de Valcarce, placed on another pilgrim route leading to Santiago de Compostela. An ordinary day on such a biking pilgrimage looks approximately like this: getting up at 6-7 a.m., morning routine, Holy Mass served in a nearby church or right in the place of the overnight stay (usually a gym or a similar big hall). A breakfast after the mass, prepared early in the morning by our magician cook and her assistant. Eating usually standing up in front of the hall, then getting on bikes and leaving in groups of 3-10 cyclists. 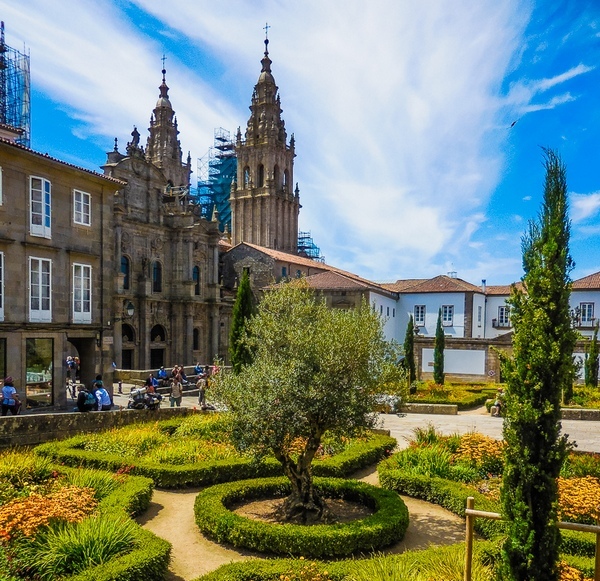 The route is not planned rigidly, it’s just recommended so that the groups adjust the route as they need – visiting places of interest, landmarks, cafés and restaurants along the route is individual. Food is also individual – some have supplies from home, some eat in bistros or fastfood along the way. The only condition is to get safe and sound to the place of another overnight stay where there is the dinner ready, again prepared by our great cook (imagine you prepare meal for 120 people on a single cooker). After the dinner we share our daily experiences and shortly after that we go to sleep to gain strength for another day on a bike. 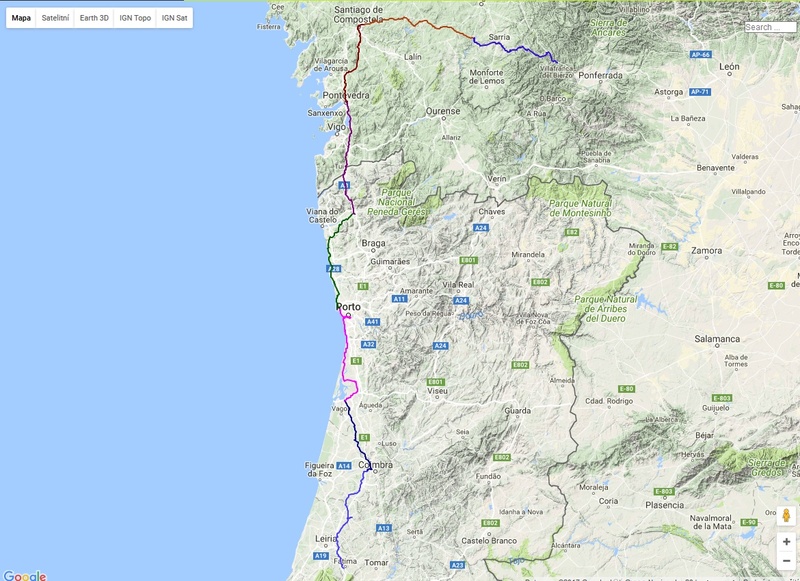 This year we slept in Vega de Valcarce, Portomarino, Santiago de Compostela, Pontevedra, Ponte de Lima, Porto, Aveira, Coimbra and Fátima. We had loads of new experiences: bike crashes, wild fires in Portugal and also incredibly beautiful views of the landscape, lots of very nice and hospitable people, and of course the spiritual atmosphere in Santiago and Fátima. See attached photos.